The inherited methods and data are those that are declared public or protected inside the super class. Using(Extending) same Engine. Note : The object of the sub-class was created inside the main. The class Sub extends the class Add. This ist derives all the protected and public members of the class Add. The class Sub contains a method of it own, Sub_xy()/ The Object of class Sub in the main() is used to assign values to x and y and then the two methods are called. Java does not support multiple inheritance directly. 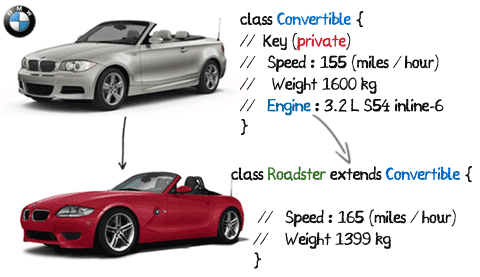 This means that the class in Java cannot have more than one super class. is illegal/not permitted in Java. An important aspect which is missing, is the relationship between the super-class and the derived sub-class. Inheritance should be used when we see an "is a" relationship. we can't say that Sub is a Add. Always when using inheritance check whether you have the "is a" relationship. Do not inherit for the sake of inheriting methods from another class. The two classes should have a natural "is a" relation.